Rebecca L. Evans, Attorney-at-Law, is an Associate Attorney at the Law Office of Deborah N Arthur. Earning her B.S. in Public Administration with a minor in Conflict Analysis and Resolution from George Mason University, she continued her education, earning her J.D. from George Mason University School of Law. 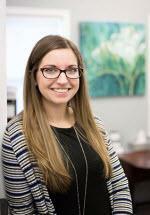 Rebecca primarily assists our clients in the areas of estate planning and estate administration. This includes but is not limited to the areas of Wills, Revocable Living Trusts, Advanced Medical Directives, Financial Powers of Attorney, Probate, and Trust Administration. Like Deborah N Arthur, Rebecca L Evan's background and upbringing lend a personal touch to the mechanics of the legal practice and allows the firm to truly care about our clients' problems. Like her mother Deborah Arthur, Rebecca L Evans has lived in Northern Virginia all of her life. She is married to Samuel Evans has two amazing children -- Victoria and Austin -- who you may see at the office from time to time. She also has two beagles -- Lucy and Bella. Rebecca L. Evans is a graduate of Immanuel Christian School in North Springfield, West Springfield High School and George Mason University as well as George Mason University School of Law. Rebecca L. Evans is a member of the Virginia and Fairfax County Bar Associations and actively participates in bar committees and activities. Mrs. Evans is an active member at Immanuel Bible Church in Springfield, Virginia.